I'm having a large amount of guests over tomorrow and I wanted to know how can keep large portions of food hot and ready to serve without it getting cold or damp, while also keeping my deserts cool and refreshing. I'm serving Pasta, Sandwiches, Chicken, Fries & Cold Deserts. 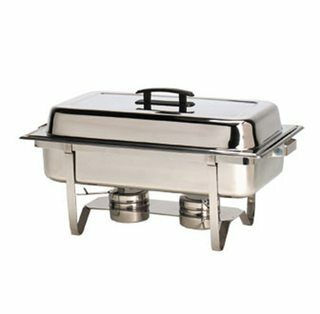 I'm looking for a tech savvy and cheap way to keep my food hot and cold accordingly and any advice would be helpful. Standard answer is hotel pans and chaffing dishes with alcohol burners for the hot items. Double hotel pans with ice between them for the cold items. Coolers work well for storing items before serve. Things that are fried though would do much better in an oven set to the lowest temp, coolers will trap moisture and they will lose their crispness. Depending how many people you have over, and assuming the party is at your house, a lot of that is just fine at lukewarm rather than piping hot; you could stuff the pasta and chicken into an oven set to "Warm" or "200F" or whatever the lowest heat is, which keeps it dry and warm, and keep the desserts in the fridge, covered to prevent moisture. If you're just having a medium-sized dinner party, this is the simplest suggestion. Find two vessels that nest inside of each other, with decent sides, fill the larger one with ice, then place the smaller one on top, with the food inside it. 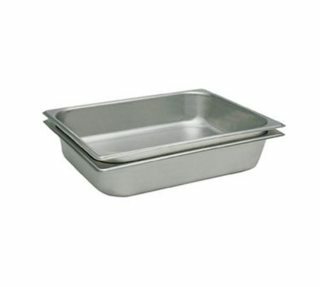 Examples include cake pans (not springform), 9x12 and 10x15 glass dishes, casserole dishes, etc. Crock pots set on warm : work well for liquid or really wet items; should work for pasta. Keep things on your grill, set to a low flame (if propane), or start 1/2 a chimney early, and let it die down before your guests arrive. Make your own chafing dish : You'll need a sheet pan, 5 bricks, a wire rack, and a bunch of tea candles. Place the bricks in the corner of the sheet pan, plus one in the middle. Set the tea candles in between. (you only need 4 for a 1/2 sheet pan), then place the wire rack on top. (one from a grill or your oven will be more durable than a cooling rack). Light the candles, then place oven-save dishes above them. You might need to replace the tea candles after an hour or so. ... but to make things easier, I'd consider not putting out all of the food at once. Hold half or two-thirds of it in reserve, in the fridge, oven or on the stove, and top-off things as they're depleted. How much to hold depends on how long the event is going to be, and if you're expecting the crowd to show up all at once, or trickle in over time. Not the answer you're looking for? Browse other questions tagged equipment temperature serving or ask your own question. Keeping food warm: does cast iron make a suitable potluck vessel? How do I avoid hot fudge turning my ice cream into a soupy mess?